WooHoo! The blog is loading photos again without a struggle. To celebrate, here is a lovely shot through my windshield (I’m not proud) of a double rainbow. This entry was posted in Once in a while events, Restaurants, Take Out, University Place, WA State - Pierce County and tagged double, McDonalds, rainbow, University Place on October 25, 2016 by admin. Most years I manage to go to the University Place Garden Tour which is spearheaded by The University Place Historical Society (UPHS). This year the theme was “Spring into Summer,” and there were five gardens and the Curran House. Each garden had several docents that were amiable and knowledgeable. The gardens varied significantly. One was a farm like setting, one was packed with flowers, one had hidden art and a stunning view, one had 100+ rhododendrons and one was a reclaimed barren lot. It was really a delight to visit each one with my friends and daughter. Lunch was an unexpected bonus. This entry was posted in Farms and Gardens, Once in a while events, University Place, WA State - Pierce County and tagged 2016, Curran House, deer, gardens, historic society, plants, spring into summer, tour, University Place, University Place Historical Society on May 22, 2016 by admin. I was pretty excited when I learned that Whole Foods was opening up a location in University Place (Chambers Bay Whole Foods, 3515 Bridgeport Way West, University Place, WA 98466). We had a Whole Foods near us (kind of) when we lived in Dallas and I’ve always enjoyed shopping there. My day to day shopping is elsewhere, but Whole Foods was a pleasure for a once in a while treat. 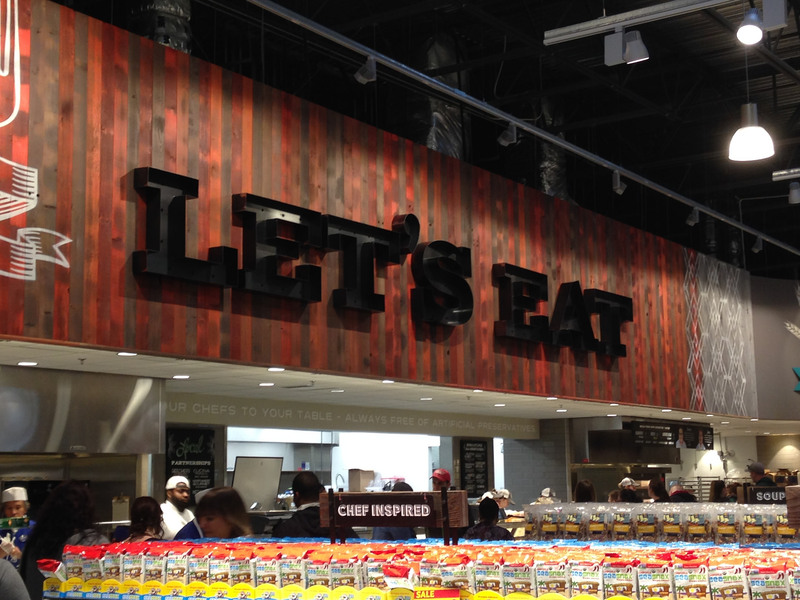 I went to Chambers Bay Whole Food’s grand opening with live music and free samples. It was a lively event! But yesterday I went back to see how they are doing now that the opening is over and the US Open has left town. Their employees are helpful, cheerful and knowledgeable. Free samples! Lots of delicious fresh fruit and even a little wine. There is plenty of parking and an entire underground parking lot also. Plenty of ‘to go’ meal options including pizza by the slice, salad bar, hot food bar, juice bar, coffee bar with adjacent bakery, a bar bar (yes, you can have beer or wine with your pizza there in the store!) and other made to order goods. They have a lovely Facebook Page. Their website is also well done. They have a good selection of local produce and other goods. For example there is an upcoming brewer’s night with local beer brewers. All kinds of products that I don’t see elsewhere. I love the octopus on the narrows bridge art over the cheese shop! Well, they are expensive. For example the leg cramp medicine my husband uses was 1/3 more expensive than it is on Amazon. Though I found quite a few reasonably priced items and some of the sale items (I love their soaps) were a steal! This location doesn’t carry Tom’s Shoes, which is what brought me there. In fact they have very little in the way of clothes. That’s OK, if I want clothes with my groceries I go to Fred Meyers. Though I really wanted to check the fit on the new Tom’s sneakers. Like Trader Joe’s, Whole Foods doesn’t stock most day to day items, so if I want Pepsi or Oreo Cookies, I need to go elsewhere. They do have healthy options to sodas and sweets. I was looking forward to taking a class or two there and they don’t seem to be set up for that. Maybe in the future. The good outweighs the not so good and I’m delighted that they are here. This entry was posted in Chain stores (there are a bunch of them), Restaurants, Stores and other places that sell you things, Tacoma, Take Out, Unique Shopping (stores with some personality), WA State - Pierce County and tagged beer, Chambers Bay, grocery, market, parking, pizza, produce, soap, supermarket, University Place, Whole Foods, wine on July 12, 2015 by admin. 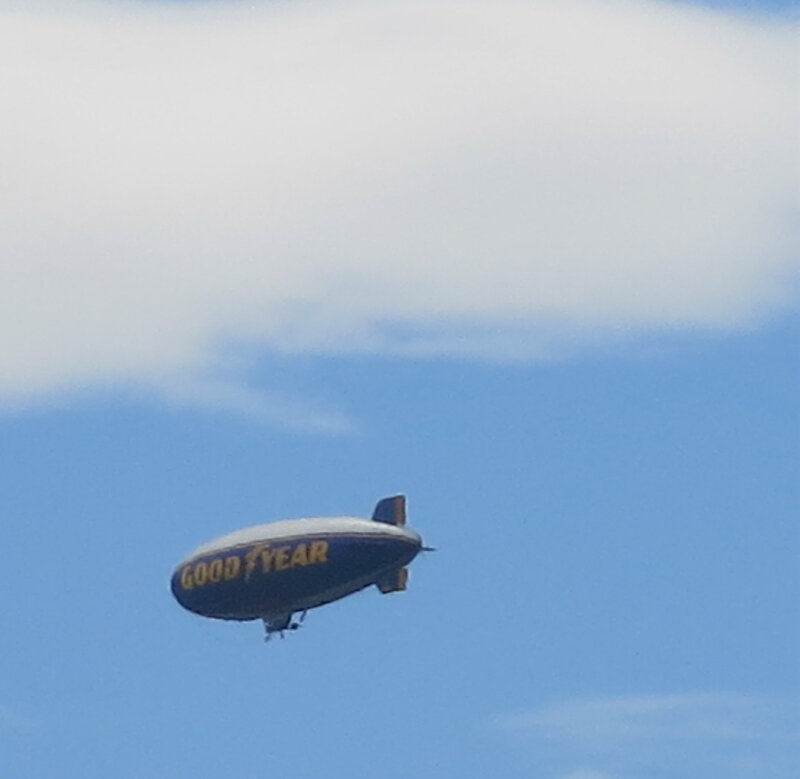 I hadn’t seen the Good Year Blimp in years, but there it was flying over University Place during the U.S. Open. This photo was taken on June 18th and it is the very best that my camera could do on full zoom. There are three Goodyear blimps in the fleet and I suspect that this one is the Spirit of America, which is based out of Carson, California. More information on this particular blimp can be found here. The official Goodyear Blimp website has a great deal more information about these wonderful, helium filled flight machines. They have a regularly updated Facebook page too! 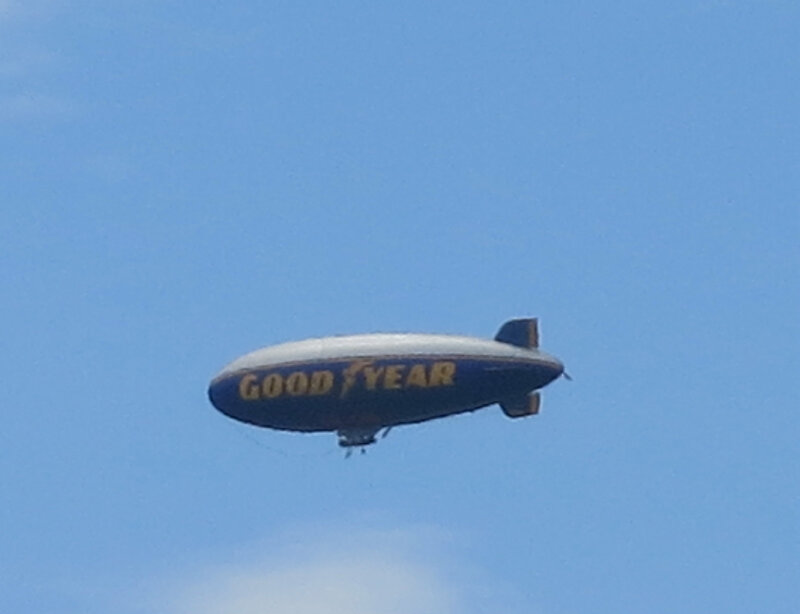 This entry was posted in Once in a while events, Travel, University Place, WA State - Pierce County and tagged Air, Blimp, golf, Good Year, Goodyear, Goodyear Blimp, U.S. Open, University Place, US Open, WA on July 9, 2015 by admin. A quick survey of my Facebook friends let me know that there are four Tacoma area bridges/overpasses that are being used as Bridge of Locks. On Sunday, which had glorious weather, I went to Bridge to the Beach that crosses the railroad tracks at Chambers Bay Regional Park in University Place. I hadn’t realized that I could drive down to the bottom of the park and I also didn’t know there was a bridge to the beach. What an amazing park it has turned into! There were families and couples with plenty of dogs. There were huge kites and picnics and music. Really it was splendid. I was there in August 2011 and it has significantly updated since then! A short stroll took me to the modern bridge and at first I only saw a lock or two, but then there was a little cluster of them and at the end of the elevated pathway there were a number of them. Unlike many of the other Bridge of Locks, the arrangement of the Bridge to the Beach is such that each locks does not have its own little area, but instead can slide back and forth. This was a pretty exciting discovery for the four year old next to me! Bridges of Locks are relatively new on a wide spread basis. 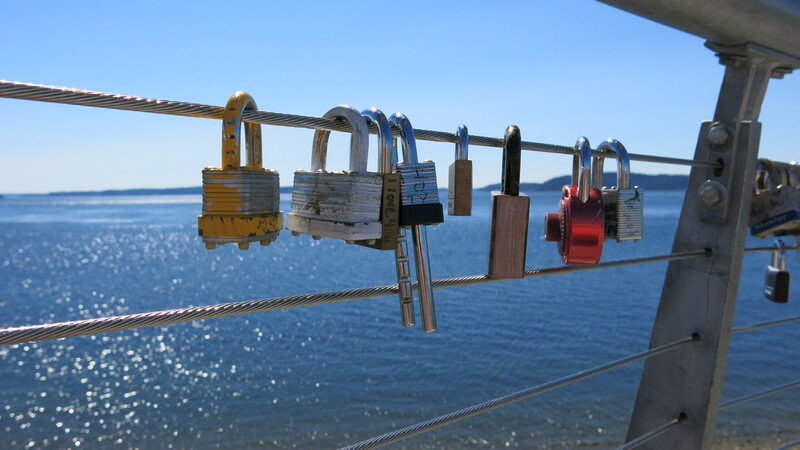 The tradition is that those in love put their name on a lock then attach it to the bridge and throw the key away to symbolize their unfailing devotion. This is a worldwide phenomena, as can be seen here. Oh, and there is a picture of an osprey, just because they are such cool birds! 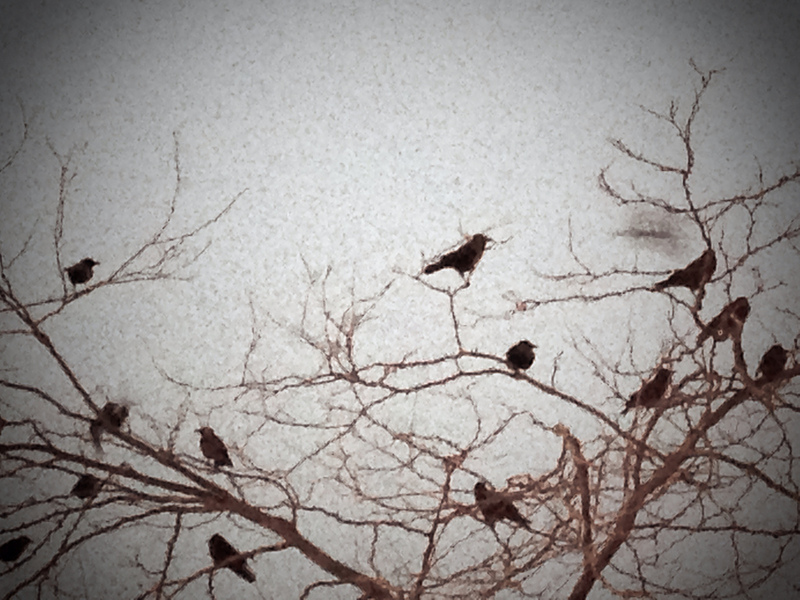 Their wing span can be almost 6′ across, though I don’t know about the one on the nest. This entry was posted in Art -- there is art here!, Community Space, Parks, University Place, WA State - Pierce County and tagged Bridge, Bridge of Locks, Bridge to the Beach, Bridges of Locks, Chambers Bay, Chambers Bay Regional Park, key, keys, Locks, love, osprey, Park, University Place on July 29, 2014 by admin. 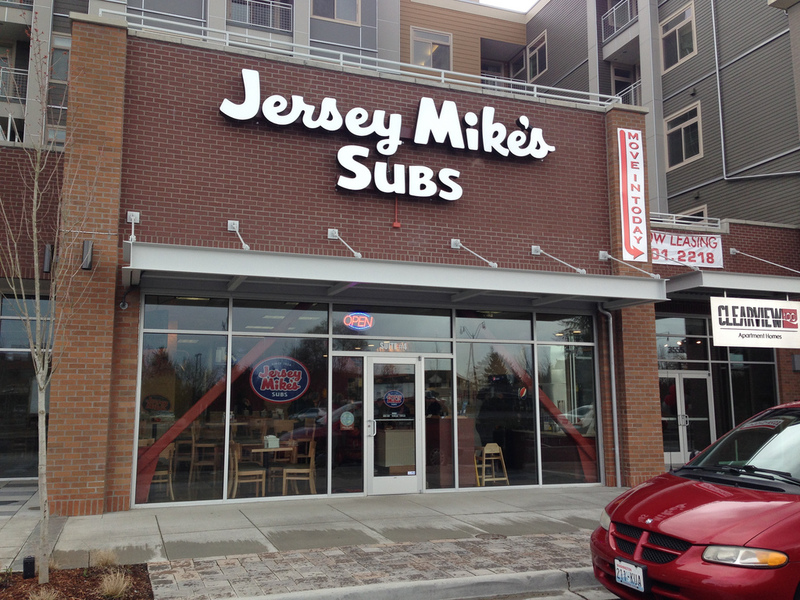 Jersey Mike’s Subs has newly opened at 3555 Market Place, Suite 4, University Place, WA 98466. I hadn’t heard of the chain before, despite the fact they have over 1,300 locations! The first Jersey Mike’s was in Point Pleasant, NJ in the 1970s not too far from where I had my annual Jersey Shore summer family vacation. Anyway this location is a good new place for dear husband and I to pick up a cheese steak or a sub. 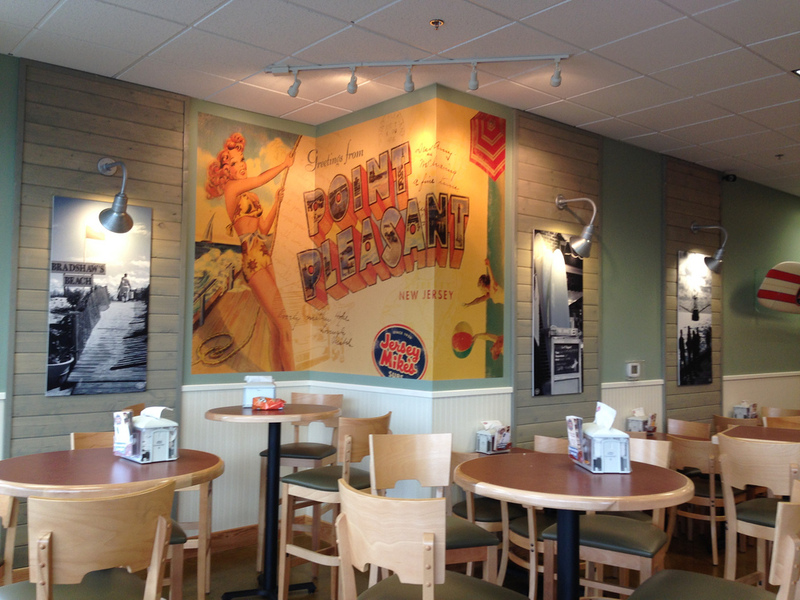 There are also Jersey Mike’s in Gig Harbor and Puyallup. This entry was posted in Coffee Shops, cafes and bistros, Restaurants, Take Out, University Place, WA State - Pierce County and tagged hoggies, Jersey Mike's Subs, Jersey Shore, sandwiches, University Place, WA on March 30, 2014 by admin. The house along 67th Avenue West near its intersection with 36th Street West obviously belongs to a Seahawks fan! Let’s hope that the enthusiastic decorating job brings the Seahawks luck in the Superbowl! 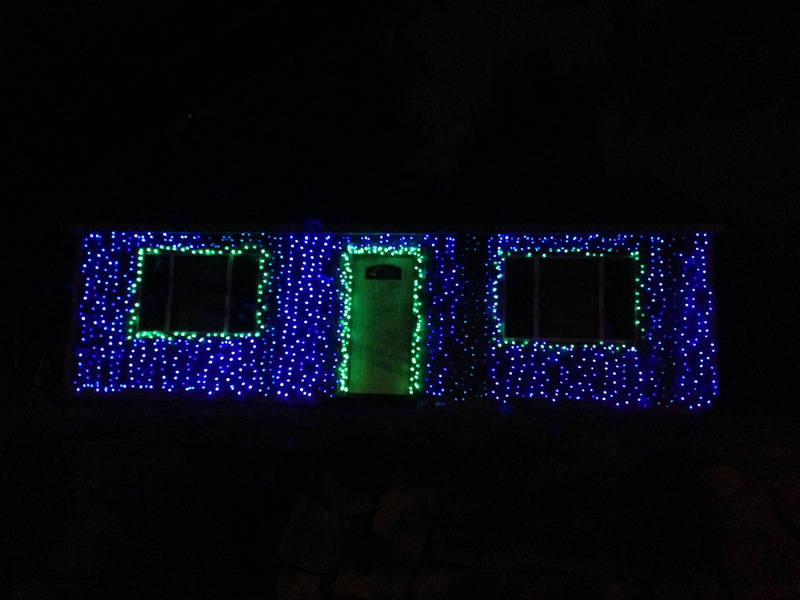 This entry was posted in Art -- there is art here!, Residential, Sports, University Place, WA State - Pierce County and tagged decoration, house, lights, residential, Seahawks, University Place, WA on January 31, 2014 by admin. 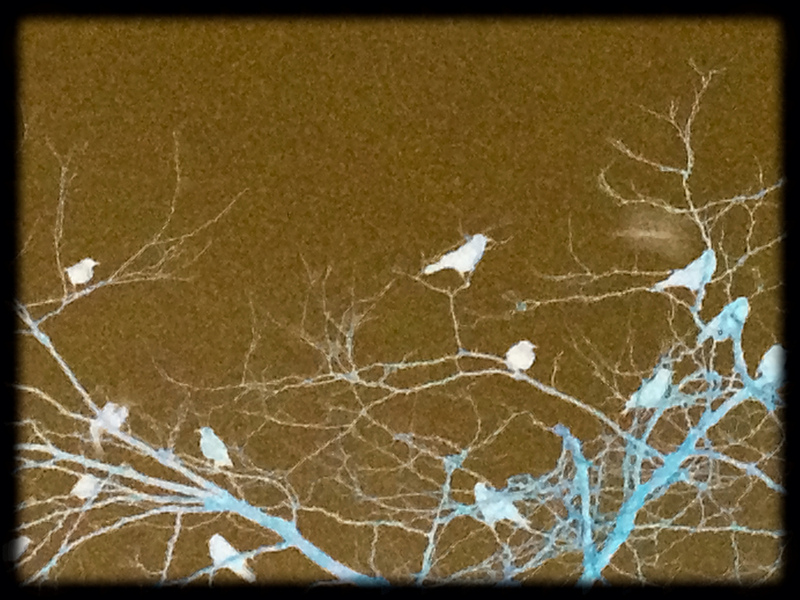 An early morning at Green Firs Village Shopping Center Parking Lot in University Place provided a photo of several birds in a tree. But it was more fun was I reversed it and added a frame. This entry was posted in Uncategorized and tagged birds, dawn, Green FIrs, morning, tree, University Place on December 20, 2013 by admin. I really needed to stretch my legs and for a couple of minutes it wasn’t foggy, so I sent off to see the Chambers Bay Labyrinth off of 64th Street. The labyrinth is based on the Chartres Cathedral labyrinth in France. At first I saw no discernible pattern, but after a while it became apparent and I walked its twisting ways to the center. More information on the labyrinth can be found here. And the worldwide labyrinth locator can be found here. 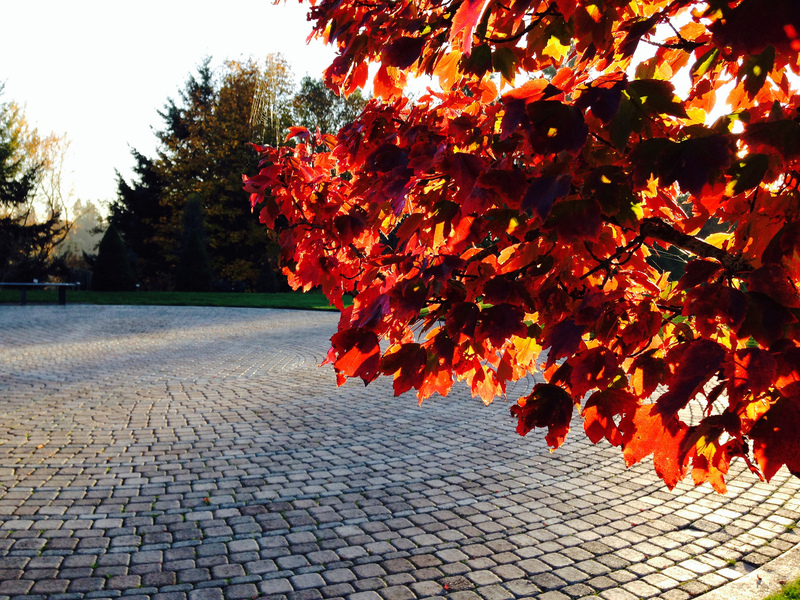 This entry was posted in Art -- there is art here!, Parks, University Place, WA State - Pierce County and tagged Chambers Bay, Chartres Cathedral, circle, France, labyrinth, Meditation, path, University Place, up, walk on October 22, 2013 by admin. 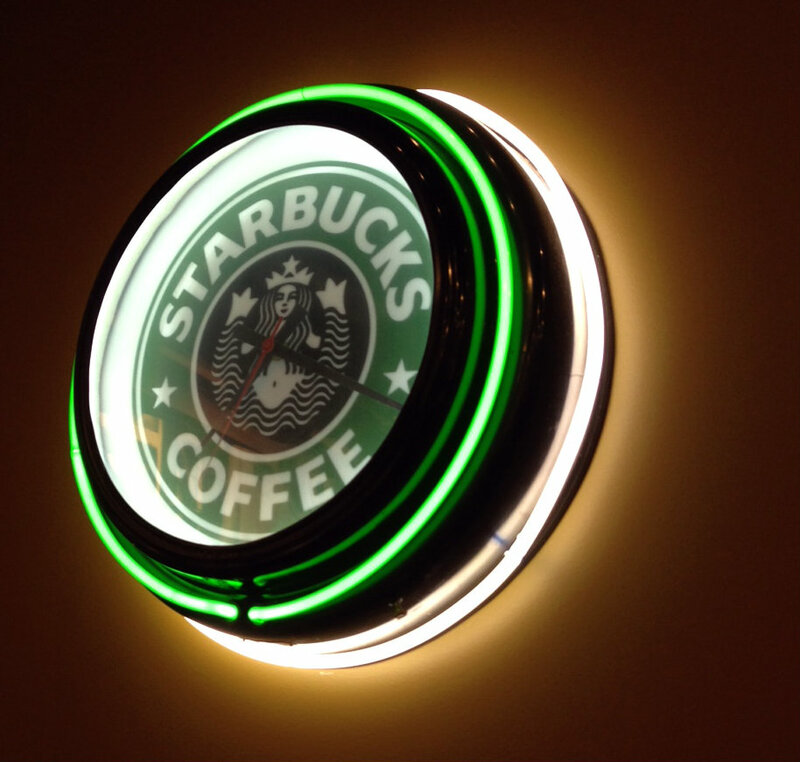 The new Starbucks in the Green Firs Shopping Center is at the site of the former Shari’s Restaurant. When this Starbucks opened, the smaller Starbucks in the center closed and of course the employees moved over. 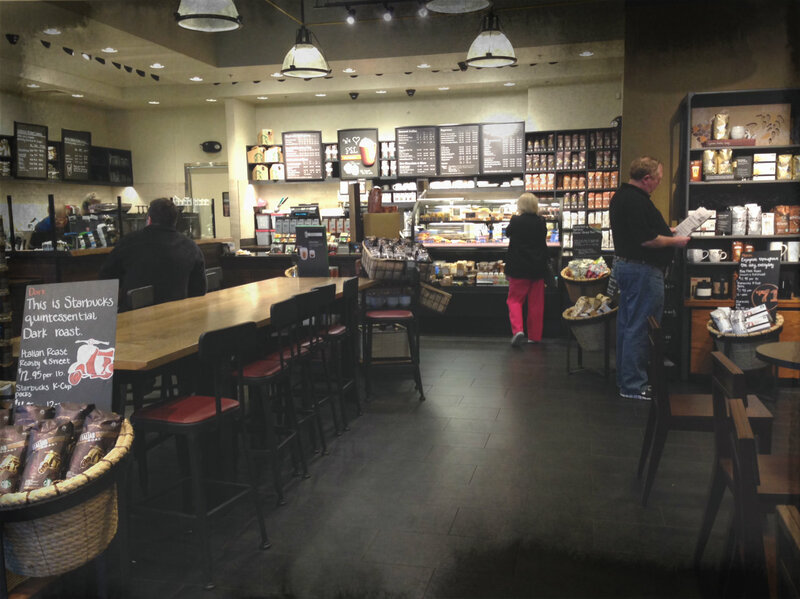 This entry was posted in Coffee Shops, cafes and bistros, Restaurants, University Place, WA State - Pierce County and tagged clock, coffee, Green FIrs, mermaid, shopping center, Starbucks, University Place on October 8, 2013 by admin.